As well as our usual operation on HF, this year’s trip to Mull will see us active on 10GHz (3cm) – a first-time activation for IO66 square. Today, John G4BAO, Rob M0VFC and Gavin M1BXF tested the kit that John’s been busy building – and it all worked! The setup is an FT-817 as the driver, DB6NT transverter locked to a 10MHz GPS disciplined oscillator, 10W PA feeding a dual 10/24GHz feed to a 60cm ex-Sky dish (about 5W of transmit power actually makes it as far as the feedpoint of the dish). The transverter and PA are mounted at the top of mast along with the dish, so power, 10MHz and 144MHz all run down to the van. John began by aligning the dish against the nearby GB3CAM beacon – a fantastic signal, even with a screwdriver as the antenna – before we mounted it on Flossie’s mast for some more realistic tests. We enjoyed QSOs with G4CBW (IO83ub), G4KUX (IO94bp, our best DX at over 300km), G4BEL (JO02bi… OK, not such an impressive distance but great to chat!) and G4LRP (IO93ho). 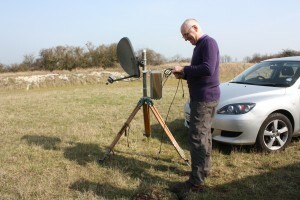 Bob, G8DTF heard us, but sadly we didn’t complete a QSO – our receive not helped by us having to beam straight at a rather noisy comms site in his direction! And if I didn’t need to convince you of that, because you’re already QRV on 10GHz and would like a sked while we’re on Mull at the start of May, let us know – we’d be delighted to try and work you.